Welcome to our CTMH Stamp of the Month Blog Hop! 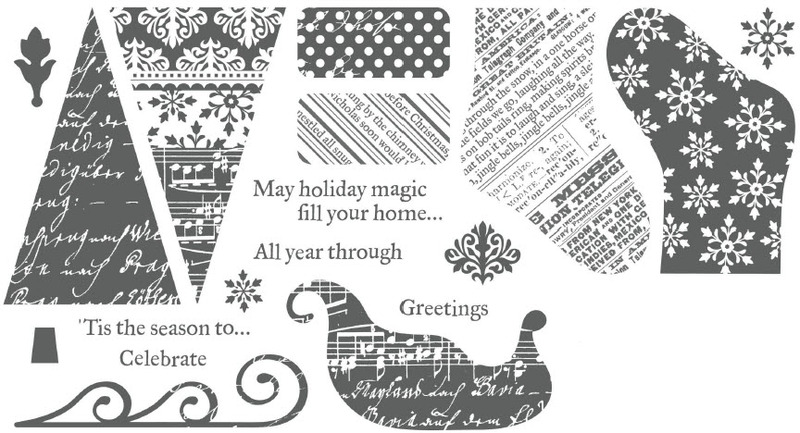 We will be featuring October's SOTM called Holiday Magic, which is an wonderfully cheerful set of 18 stamps. I have been dying to bust this on out since July, and it's finally time! I just LOVE Christmas Stamps! If you have come here from JILL'S BLOG you are on the right path. If you get lost, you may want to go back to Helen's Blog to find the entire list of blog hoppers! This month we have over 60 Close To My Heart Consultants sharing beautifully crafted artistic creations using this month's SOTM and other great CTMH products on their blogs. Hopping is simple to do - just click on the link at the end of the post on each blog to move to the next one! Here we go! I saw a window card on Pinterest and it made me think, "Our tree would be so cute for that!" So I whipped out some window diecuts using the new CTMH Art Philosophy Cricut Cartridge (Decorative Layer, Square 1). I made two for the card, and layered between them a bit of page protector that I embossed with snowflakes stamped in White Daisy Ink and then sprayed the window plastic with the spritz pen filled with 10 drops white Daisy Ink and water before carefully embossing with Clear Detail EP so the plastic wouldn't melt. I love that the CTMH heat tool is a lower temp so I can achieve results like this without ruining my project! I used the Cricut Window diecut as a template for where to cut the hole in my card front and Believe Plaid paper to make the window. Then I realized - with a big window like that, everything I make to embellish my card needs to be 3-D or double sided! I textured my wooden window frames by lightly stamping repeatedly with the striped stocking cuff image in Desert Sand ink...front AND back! I did a resist embossing technique for the trees, stamping the image onto Sweet Leaf Cardstock with White Daisy ink (to "frost" the tree image) and clear embossing, then inking over with Ponderosa Pine ink to bring out the embossed pattern. I decked my tree out in strings of Bitty sparkles and Red and clear bigger Sparkles (even on the back -the tree is double sided, remember?). I added one of the cute new Corrugated stars painted with Pearl Paint, and a fabulous Bling button to finish off my card front. Couldn't you just put those on everything? On the inside I rolled the scripty tree in Sweet Leaf and Ponderosa Pine inks to create my snow scene trees. I stamped the snowflakes in Pearl Paint embossed with Clear EP across the top. I added scrap Desert Sand Cardstock tree stumps, inked direct to paper with my Desert Sand Ink pad. Finally I carefully stamped the second half of the sentiment so it would hide behind the window frame when the card was closed...no peeking! I've alsodone an adorable Baby Card using the stocking from this set as a baby Bootie. I love to find a non-traditional use for every stamp set! Now "Hop" on over to KATY'S BLOG to see what adorable thing she's crafted! Be sure to visit all the Consultants in the hop to get some great crafty ideas for more fun projects! Remember, the October SOTM is only available until the last day of the month. Be sure to ask your CTMH Consultant how to get yours for just $5 or click here to shop now and bring this "Holiday Magic" home to you. This post also added to the Heart 2 Heart Die Cuts Challenge. Wow! Love all the technique you put into this card. It is beautiful. Great card. Love the window idea, and you did a fabulous job with it. Love the window card and the "booty" card! Wow! This is a one-of-a-kind unique card. Love what you did with it. Definitely took it up a notch for the rest of us. LOL Wow...whoops, already said that. AH! I LOVE your window card. How cool! Beautiful! I love the window--what a fabulous idea! Absolutely stunning. Your techniques are awe-inspiring! OMG this is such a darling card! I love the windows!! Cute, cute, cute!! Wendy! I totally adore your card. The windows are so cute!